The Lutheran East Football team and Corporate Search Consultants put on their 3rd Annual Career Day on Wednesday, March 21. Each year our student-athletes have an opportunity to learn about Cleveland-based organizations, the product or service that the businesses provide, and potential careers within those companies. Business leaders from manufacturing, technology, and distribution industries provided in-depth insight into their companies and how to be successful in their professional settings. In total, 15 Junior and Senior student-athletes participated and walked away learning about the local business community. 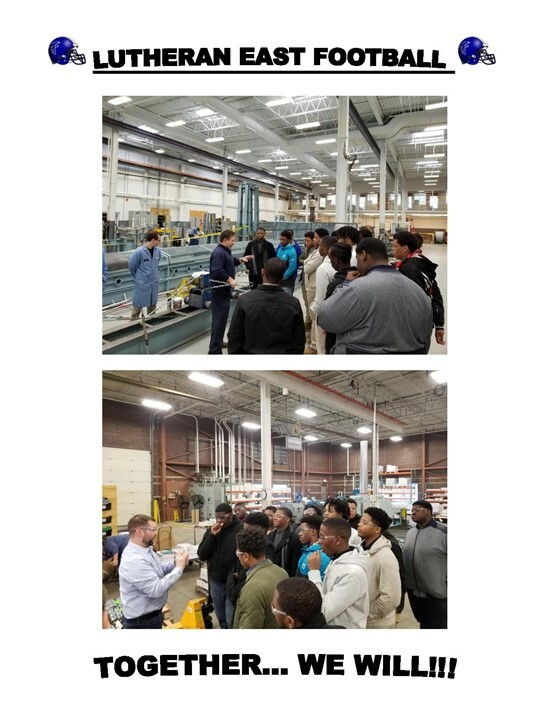 Our student-athletes were given tours of manufacturing facilities, offices, and technology centers with each organization providing their history, mission, and success in their given industry. In addition, our players were given advice on how to achieve their goals, potential internship and educational program opportunities, and the networking experience to better themselves in the future. All of the organizations did a fantastic job of laying out their information, and we are very thankful to have such wonderful companies right here in northeast Ohio! Corporate Search Consultants is a boutique recruiting firm that performs permanent and contract placement services to organizations throughout Ohio. As a Recruiting Manager, it is a privilege to work with many companies that care about the community and the betterment of local students. Thank you very much to those who were able to participate!